A police officer, who flew into a rage over the break-up of his nine-year marriage, stabbed his wife and then hanged himself an inquest has heard. 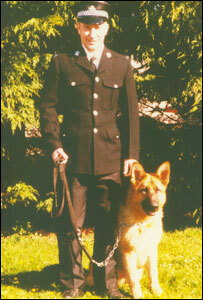 The body of dog handler Pc Lance Williams, 38, from Llandrindod Wells, Powys, was found at his home after he attacked his wife, Wendy, 36. 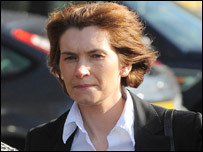 The Brecon inquest heard she suffered stab wounds to her chest during the attack in front of their two children. Powys Coroner Peter Maddox recorded a verdict of suicide. The inquest heard that the police officer flew into a rage when his wife arrived at his home to collect their two children. The hearing was told how an "aggressive" Pc Williams dragged his wife into the hallway and punched and kicked her before stabbing her with a kitchen knife. The couple's children fled the scene screaming: "Daddy's stabbing Mummy", the inquest heard. It also heard Pc Williams had stabbed himself in the chest before hanging himself from the attic hatch at his modern detached house. Giving evidence, Mrs Williams said: "I promised Lance that even though our marriage had broken down I would never take the children away from him. "In the month we had been apart, there had only been three days when he hadn't seen them and that was because of his work." The inquest heard the pair had been married for nearly nine years, and since their split the children had been living with their mother. It was Mrs Williams's birthday on the day of the attack last June, and she said that her husband did "not look his usual self" when she arrived at his house to collect the children. She added: "He looked angry and his eye was bloodshot and he was aggressive. He told me to get off his land. "He told me I had ruined his life. I told him not to be silly - I didn't want to argue in front of the children. That is when he grabbed hold of my wrist and pushed me to the floor. "He started punching and kicking me in the head. I can remember the kids shouting: 'Stop it, stop it', but he just carried on." Council office worker Mrs Williams said she blacked out for a moment and woke to see her husband with a kitchen knife. The inquest heard that he cut her hand and was trying to push the knife into her chest. She shouted to the children to get help. Pc Williams's sister Adele Pitt said her brother phoned on the day he died. "He was crying and seemed extremely distressed," she said. "He said: 'I've done it.' I asked him what he had done and not to do anything silly. "He said: 'I love you', and then put the phone down." Recording a verdict of suicide, the coroner said something must have acted as a catalyst that day to make the "well respected officer" behave so aggressively. "What is clear is that the behaviour of Pc Williams was entirely out of character," said Mr Maddox. "I have heard many witnesses who said he was not a very aggressive man."